With around 40 lemon sharks circling the boat, 17-year-old Matteo Pollini admits he felt a flutter of nerves before he jumped in. But by the end of five days of diving in the chummed up waters of Tiger Beach off the Bahamas, the fear was gone. The students, between ages 15 and 18, were filmed diving with reef sharks, lemon sharks and large tiger sharks for the movie, which will be screened for the first time at Shark Talk, Cayman Islands – a three-day event in November organized by the Kenneth B. Dart Foundation and the Guy Harvey Ocean Foundation.“It was just awe and respect. I just wanted to stay down as long as possible,” said the St. Ignatius student, one of five marine science students from the Cayman Islands selected for the trip as part of a new Guy Harvey documentary about changing attitudes toward the ocean’s most feared predators. “We thought, why not send a handful of students from Cayman on the expedition so they can get out and experience sharks firsthand and go to their schools and send out that message that sharks are amazing creatures that we should respect and preserve? “We wanted to do something that actually teaches people about the value of sharks to the oceanic eco system and get people to understand rather than be afraid,” he said. Dart Foundation Director Chris Duggan said Shark Talk – a weekend of movies, lectures and question-and-answer sessions – was set up as the antithesis of the Discovery Channel’s “Shark Week,” which has been accused of painting a misleading picture of sharks as voracious predators. “It was one of the most amazing experiences of their lives, and I think also of mine,” said Mr. Duggan, who joined the students on the trip. 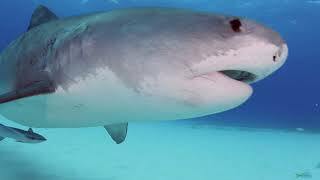 The footage of the Cayman students in the Bahamas will be part of the movie, “This is your Ocean: Sharks 2.” It is the sequel to an earlier documentary made by Mr. Harvey’s production company at Tiger Beach. Mr. Harvey said the movie would focus on the need to involve young people in shark conservation. He said the new regulations against fishing for sharks needs to be combined with education about their value to ocean communities and economies for them to be effective. The five students chosen for the trip were Kai Gunning, Myles Dawson, Matteo Polloni, Cameron Walters and Jackson Wight. Matteo said he grew up around the ocean, his grandparents were fishermen and his dad is one of the owners of Luca restaurant. He’s been diving since he was 11, but he had never seen a shark before the trip to the Bahamas last month. “My dad basically told me, you have got to go,” he said. “It is too big an opportunity to pass up because you are scared. I wanted to go anyway, but he didn’t give me a choice. “I didn’t tell my mum till after I had signed up. She wasn’t too happy,” he added. After three days of swimming with lemon sharks, he said, the group was ready for the tigers to show up. “There is obviously some fear because they are sharks that have been known to eat people. They are much bigger and more imposing than the lemon sharks. You soon realize they don’t really care about you and are just looking for the food. “By the end, we were swimming with about four tiger sharks,” said Matteo, who stayed for more than two hours diving with the tigers. Mr. Harvey says the point of the movie and of Shark Talk Cayman Islands is to take viewers and the Cayman community on the same journey from fear to respect. Shark Talk Cayman Islands starts on Nov. 10 with two mornings of documentaries and question-and-answer sessions with students at the Regal Camana Bay cinema. The students will watch “Mighty Mako,” “Guy Harvey’s Ten Favorite Sharks in the World” and “This is your Ocean: Sharks” and hear talks from scientists with Mr. Harvey’s foundation, including shark experts Brad Wetherbee and Mahmood Shivji.